Do you ever dream of days gone by when women’s clothing was adorned with flowers? This lovely rose is reminiscent of those days gone by, where beauty and femininity were present in everything aspect of our lives. This is a simple flower to make, so easy that you can in fact complete it in an hour, and where out the door! Come join us! It has been so long since I have added a favorite, and this one seems to be appropriate, because hearts in all shapes and sizes have always been a favorite of mine. 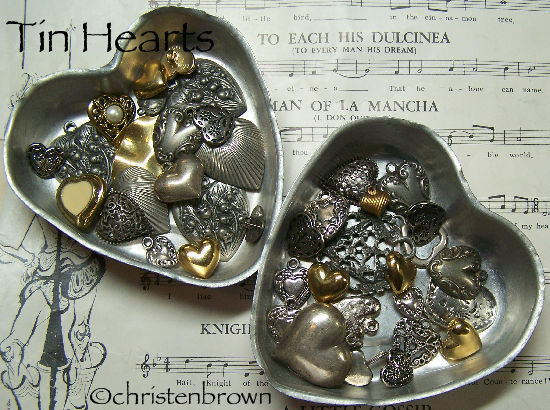 These old tin baking hearts were a thrift store find, one that I just treasure. I picked up the myriad of Valentine’s day themed ribbon in the dollar section at Target. Too cute! 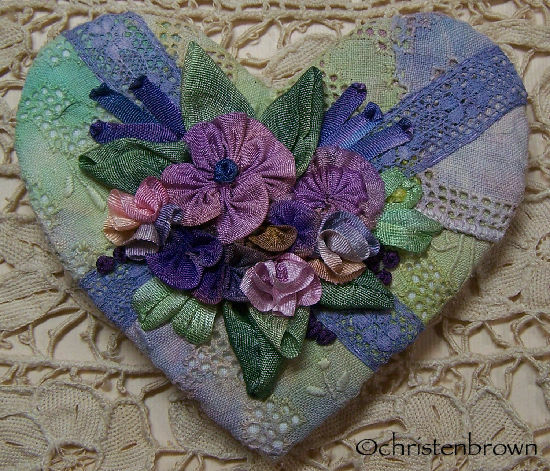 Rose Heart is a combination of two techniques from my new book, Ribbonwork Gardens. 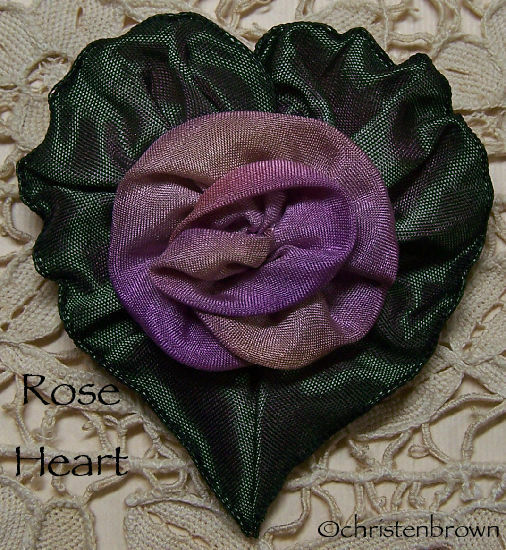 The heart shape is made from French wire ribbon, and the rose is made from Hanah Silk ribbon. 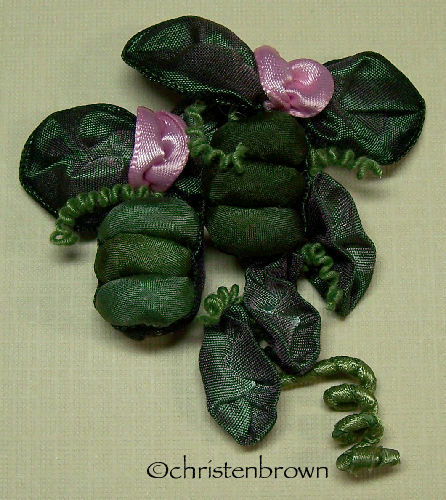 This is a small corsage. This is an embroidery sampler comprised of Traditional embroidery stitches. I teach a class called BEBE Beginning Embroidery with Bead Embellishments, that includes many of these stitches. 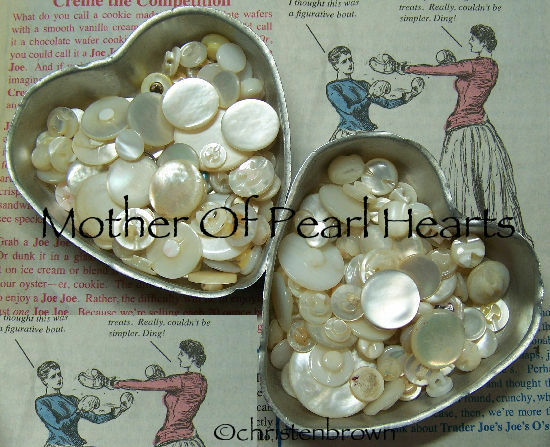 Here are my magical tin baking hearts full of my favorite buttons, Mother of Pearl. 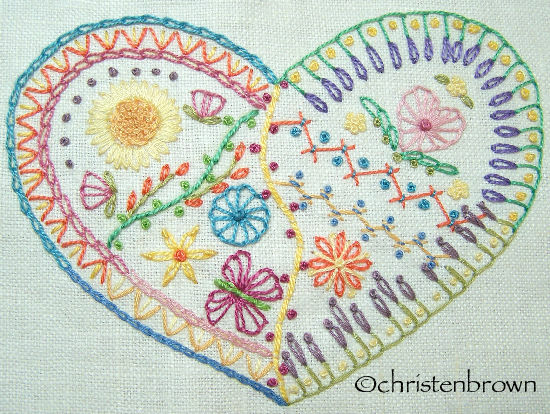 The base of this “Hanky Heart” is made from an old handkerchief that had ripped in several places. I hand-dyed what was left of the handkerchief, then hand pieced it into this heart shape. I covered the seems of the raw edges with hand-dye vintage lace. I then stitched a few ribbonwork flowers, and ribbon embroidery into this pretty little vignette. 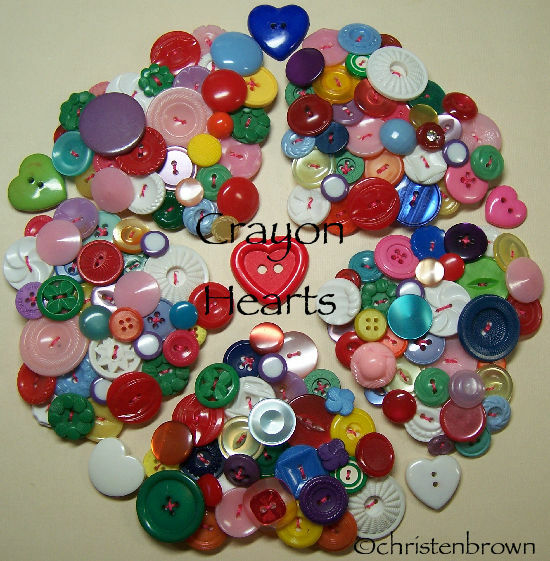 This is a grouping of heart shaped bases, covered in vintage and new plastic buttons. The base is made from Timtex, then covered in a cotton muslin. Then the buttons are stitched down with pearl cotton. Fun, fun, fun…. Here are my tin baking hearts full of vintage and new heart shaped buttons (of course). The background is a piece of sheet music from the play Don Quixote. And as far as I am concerned, you can never have too many HEARTS! 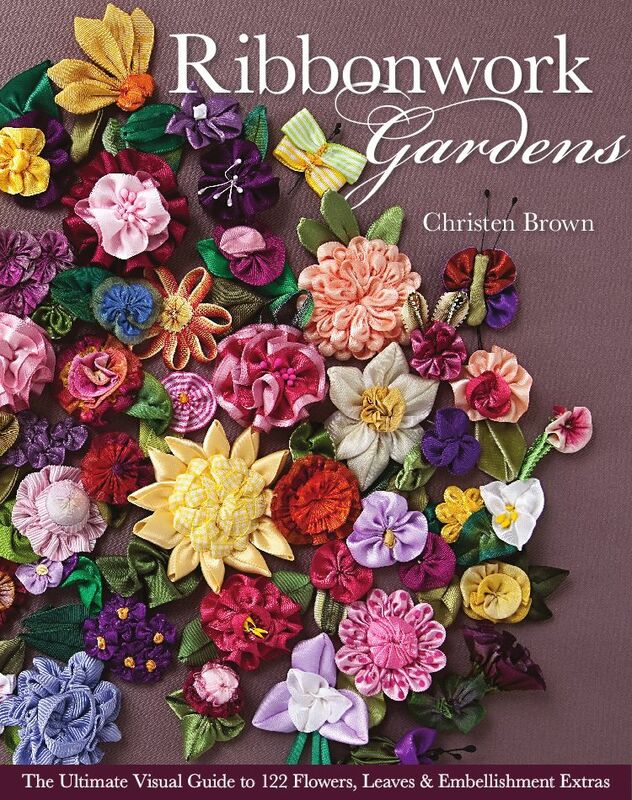 I am so excited to announce that my first book “Ribbonwork Gardens“will be available June, 2012. Advanced copies are available now at C&T Publishing! There are 122 realistic flowers, leaves and garden extras included in the book, with experience levels from easy to advanced. The flowers are showcased in six different garden settings, offering you an array of small, medium and large flowers, each paired with a leaf to create a perfect combination. I have included photographed step-by-step instructions (which I took), for each of the 122 examples. I have included a comprehensive cutting chart and have listed the types of ribbon that are suitable for each flower/leaf combination and included little extras such as French knots or beads. There are over 14 basic techniques, some traditional and some that I have created especially for this book. There is a complete compendium with ribbon styles, selection and care, and troubleshooting tips with several gallery pages and examples sprinkled throughout the book for inspiration. The book is a soft cover, and will easily fit on your workspace while you learn and create. I dedicated this book to my students, and I hope that you become one. This week’s challenge for Mixed Media Monday was to Make Something Round. There are always wonderful entries, take a look when you get a chance. I started with an old embroidery hoop and painted it black. I then took leftover scraps from an embroidered metallic scarf, and stitched these onto crinoline to stabilize the fabric. I stitched vintage bits of lace down in the center of this, and this was glued to the bottom edge of the hoop. The outer edges are covered with ruched velvet ribbon. This was glued down to the top edge of the hoop. I glued vintage and new millinery leaves to the edge, then the flowers, trim and the vintage buttons. 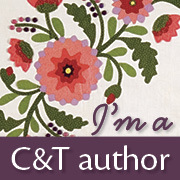 I added additional buttons to the center along with butterflies and dragonfly charms. Here is my entry for The Three Muses Challenge this week which is Hats. I wanted to make something fun, and different. My dad always wore a paper bag on his head when he worked on the car, couldn’t mess up his look or get grease on those locks! It was a great hat, and as time wore on it really acquired a lovely patina…. So I thought about taking a long not so wide paper bag and try to make my own cool hat. I had in mind the height of something similar to the wigs that Marie Antoinette wore. So I began crunching, munching and scrunching the bag into shape. The next step was to add bits of lace pieces to cover the entire hat. These pieces were a gift from a relative, but were a little on the grungy side, so actually perfect for this project. I stitched the lace into place with crochet cotton. I also stitched the brim and the top of the hat. Then I painted the lace and bits of bag that showed with four different colors of acrylic paints, I sealed the paint, then added Lumiere paints on top of this to finish off the coloring. I embellished the top and the brim with ric-rac and vintage mother of pearl buttons. I added in a bow made from French wire ribbon for the decoration. 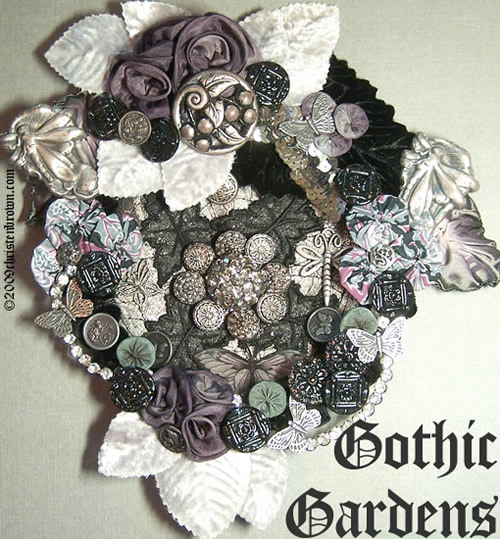 This I embellished with a few flowers and leaves that I also stitched from French and satin wire ribbons. The teddy bear was a long ago crib-mate of mine. Then I was not so concerned with names, hence the easy to remember “Bearie”. I think I was more concerned with comfort than conversation. At one point I must have been very naughty though, because she only has one ear! OOps I feel really bad about that! The tatted baby bonnet could also be considered a hat of sorts. I purchased this a few months ago at an antique shop. I changed the cord that is used to tie the hat around the neck. I stitched several silk ribbon roses with ombre ribbon leaves and stitched these around the hat. The collar that she is wearing is made from French wire ribbon that I ruched. 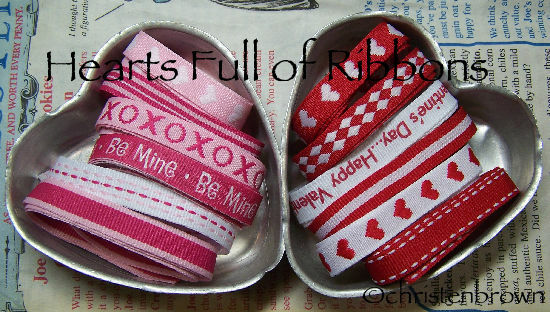 The ribbon flowers are made from vintage Jacquard ribbon and these are decorated with vintage mother of pearl buttons. I hope that you, the viewer, are not offended and don’t mind that I used Marie Antoinette as a model here for the “look”. What can I say, the muse just spoke to me… he he.